The LS230-1 (812290) Boom Arm uses an included clamp for mounting to a section post of the heavy-duty LS226-1 or similar light stand. 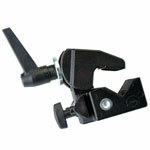 An adjustable counter balance weight allows lampheads to be positioned directly over the subject. Fully extended, the overall length of the LS230-1 Boom Arm is 6'8". The LS224-1 (812276) is a compact, general purpose stand for studio and location photography. It is air cushioned for smooth, safe height adjustments. Can be extended to a maximum height of 9 feet 5 inches. The LS222-1 (812255) is a lightweight, compact stand that travels well. It includes air cushioned sections that prevent a sudden drop that could damage lampheads. Maximum height is 7`6". The LS220-1 (812248) is a versatile background stand that allows the light to be positioned in a range from 5 inches to 2 feet 4 inches. Removing the stand post allows the lamphead to be mounted directly on the legs, just 2 inches off the floor. Note: All Norman stands are equipped with 5/8 inch mounting posts. 3lb 1 oz 4' 5"
*Minimum height for the LS220-1 is 2 inches with stand post removed. 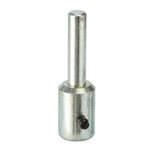 Umbrella Stand Adapter with friction float adjustment can be used to mount our battery portable or other lampheads to a light stand, using the 1/4" x 20 threaded hole in the base of the lamphead. Some Norman Lampheads use an insert that allows them to be used on a variety of light stands. 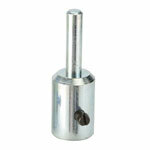 Replacement Inserts are available for mounting on 3/8" (811779), 1/2" (811744) and 5/8" (811793) stand tops. Converts 5/8” male to 3/8” male. Converts 5/8" male to 1/2" male. Stand Clamp with Ratchet Handle. 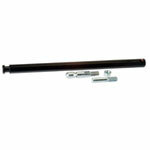 12" Extension rod with 1/2" and 3/8"
adapters. For use with AC74C.